We have a rich history of giving back to the communities where we live and work. We are dedicated to supporting causes that help improve the health and wellness of our friends, family and neighbors. 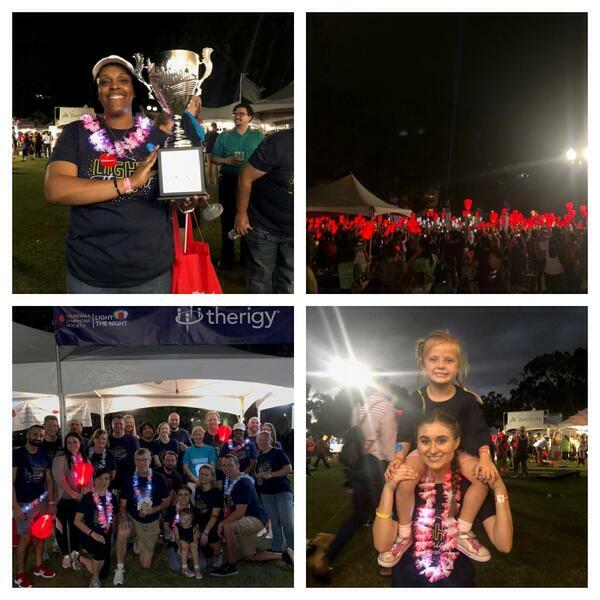 Therigy holds an annual company philanthropy fundraising effort for the Leukemia & Lymphomia Society - Light the Night Campaign. Light the Night is a series of fundraising campaigns benefiting LLS's funding of research to find blood cancer cures. Over half of our employees at Therigy have been affected in some way by someone that they know or a relative by cancer. Below is a video that shares our personal support and involvement. In 2018, Therigy raised over $11,991 to support research towards fighting cancer through a Department Breakfast Battle Challenge. Our Product Management Team was our 2018 Trophy Winner. Join Therigy in support of LLS! LLS works tirelessly to find cures and ensure patients can access the live saving treatments they need. When someone experiences the fear and uncertainty of a cancer diagnosis, LLS provides hope, compassion, education and support. Friends, families and co-workers gather together to celebrate, honor and remember those touched by cancer. Walk participants carry illuminated lanterns - white in honor of survivors and the power of research, red in support of patients and finding cures and gold in remembrance of those who have been lost.